There’s something strange wrapped in a paper towel hanging out in the basket that holds the paper coffee cups at work. Upon first look I thought it was an English muffin or a breakfast sandwich wrapped in a paper towel and placed there to keep warm. 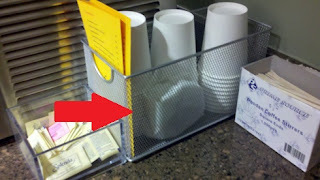 Then I thought how odd it was for a breakfast sandwich to be wedged between a stack of cups and the side of a basket. Then I thought how putting a breakfast sandwich there wouldn’t keep it warm and totally makes no sense at all. And then I poked it and realized it was not a breakfast sandwich but couldn’t determine exactly what it was and then continued with my coffee pouring because I wanted nothing to do with it after that. I promptly left and went back to my desk. And then returned to take a picture for you. I'm curious too! but probably safer not to pick it up.